This game requires a gamepad to play and Chrome is recommended. Please note this was a game jam game jam game and early prototype. It is unfinished and will not have any future updates. (B) = Stop arrow on a Suncoin! 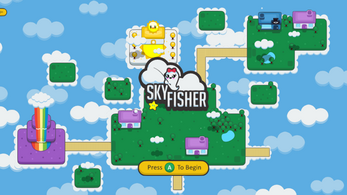 Sky Fisher is a game about fishing in the heavens. It was created in one week for #notGDCJam Game Jam. Fill your Catch Diary with 18 unique sky fish, sell your fish to earn Suncoins to find the Hat Shop! Music by the amazing Mortistar.